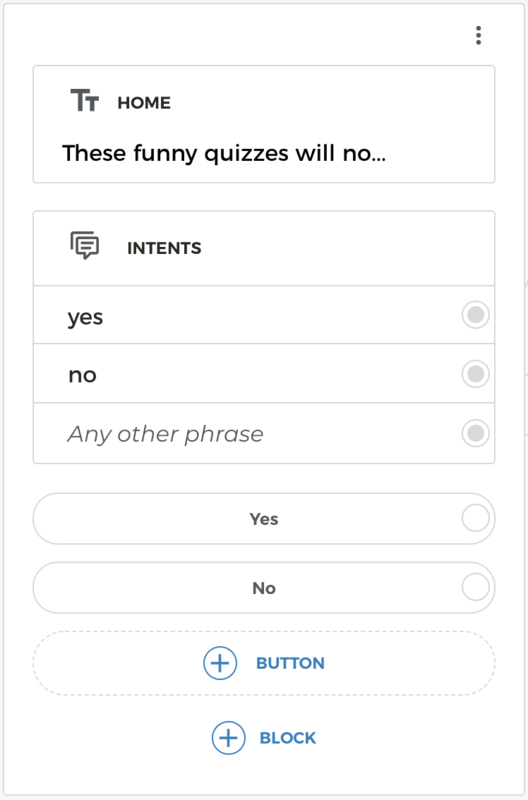 This simple scenario implements a kids quiz game, where the bot asks questions one by one, and the user answers with yes or no. Bot replies if the answer is right and tells a short interesting fact about the question. Please note that you can play with this scenario without building it. Just click on "Kids Quiz" template on a main page of Aimylogic to open a complete bot. 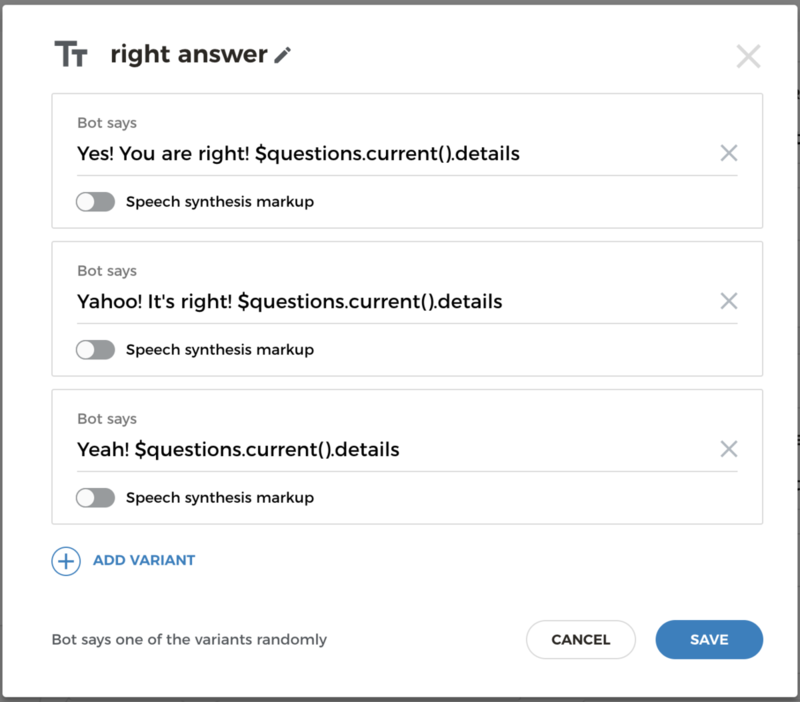 Once the user launches a bot, it offers the user to choose a quiz. For example, it may be Junior and Animals quizzes in the bot&apos;s database. Once the user made their choice, the bot fetches questions and answers of the selected quiz and start to ask questions one by one. The user replies with Yes or No answers. Bot informs the user about the right answer and provides a short interesting fact about the question. Once the list of question ends, the bot thanks the user and says goodbye. For similar tasks it&apos;s better to store the content (list of questions and answers) separated from the scenario. Thus content managers can work with a content independently from the scenario&apos;s developer. Google Sheets service enables you to create and manage your excel tables online. 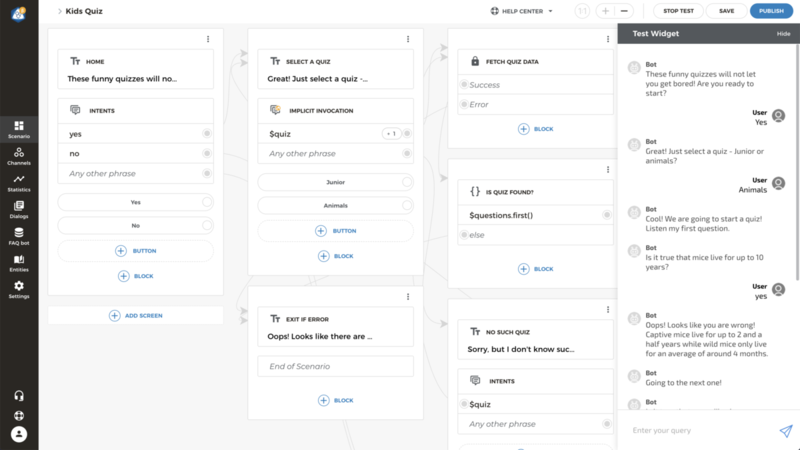 It&apos;s great tool to store some structured lists of data and then fetch it from anywhere. Aimylogic provides an advanced tool to fetch arrays of rows from any published Google Sheet. Thus we can store or questions and answers in the Google Sheet and the bot can fetch it through an HTTP Request block once it needs this data. There is a prepared template of the sheet where we stored two lists of questions-answers pairs for our quizzes. There are three columns in each list of this sheet. Each list represents an entire quiz. There are only two quizzes in this template - Junior and Animals. But you can create as many as you wish. Also add an Intents block with two intents - yes and no. If the user replies "yes", the bot should ask for a quiz to start. If no (or any other phrase) - the bot will say goodbye. Add two regular buttons (Yes and No) to allow user to simply click on the button instead of using a voice. User can select one of quizzes that are stored in the Google Sheets. And if we create a bot that should understand a natural language, we have to train our bot to understand names of these quizzes. Aimylogic enables your bots to extract some useful data from the user&apos;s replies through Entities. Click on Entities in the left menu and create a new dictionary with name quiz. Here you have to add entities according the names of your lists in Google Sheet. In the Entity column write an ordinal number of a list in your Google Sheet, and in the Synonyms column provide as many synonyms for the quiz&apos;s name as you can. Click on Save Changes button and then return in scenario. Click on yes intent on the first screen to create a second one. Add here a text that invites a user to select one of two quizzes - junior or animals. Then add an Intents block that recognises the user&apos;s choice. Check Global intents checkbox to make this block available from anywhere in scenario. 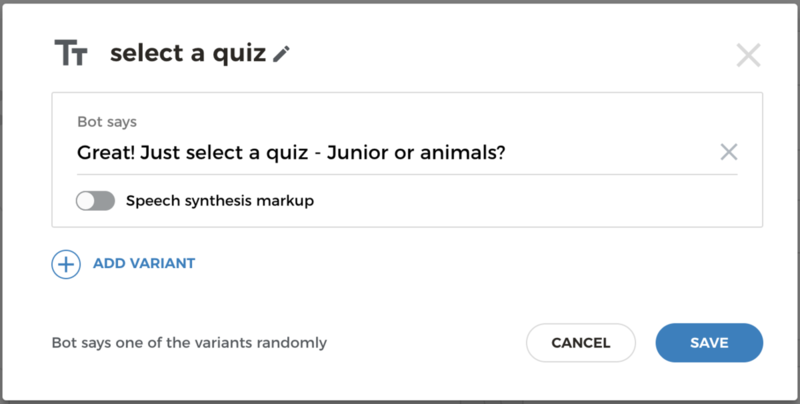 We need this to allow the user to start our future voice skill for Alexa and Google Assistant with a simple command like "Ask Kids Quiz to start Animals quiz". 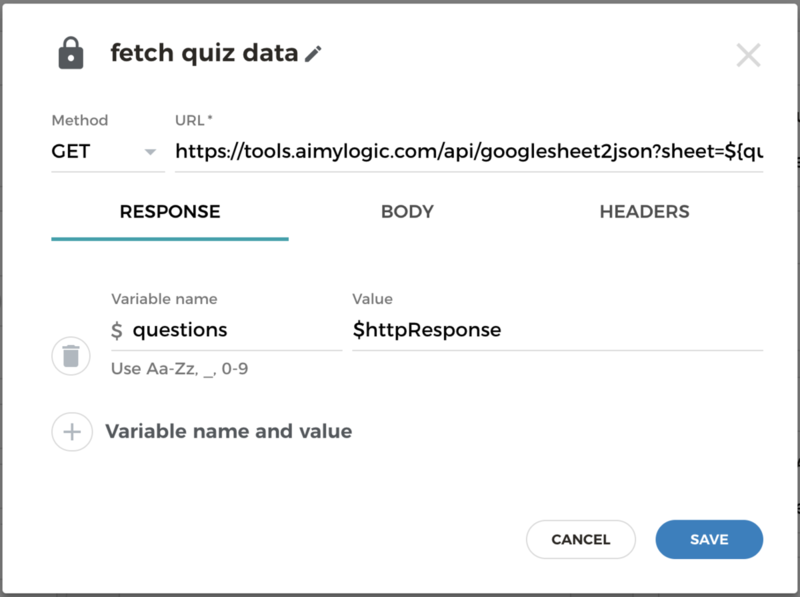 If the user replies with a quiz name, Aimylogic extracts it from the reply and creates a variable quiz with ordinal number of Google Sheet as value. Then it can be used to fetch a Google Sheet data through an HTTP request to the Google Sheets API. 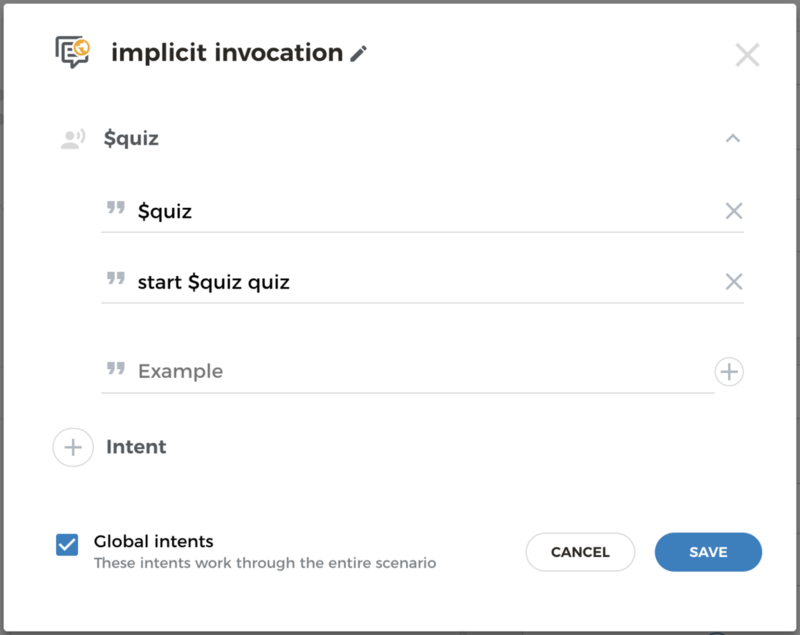 Click on $quiz intent on the second screen and add HTTP Request block. Add a variable questions that will store an entire array of rows of the selected list. Type $httpResponse as a value for this variable (httpResponse will contain a whole JSON response of HTTP response). 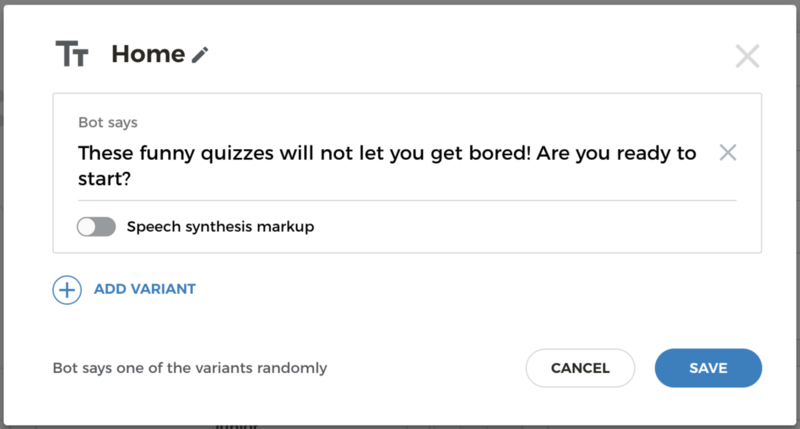 Once the quiz data is fetched from the Google Sheet, the bot should inform the user that it&apos;s ready start and ask the first question. Click on Success state in the HTTP Request block and add a Conditions block on the next screen. Here the bot checks if the questions array has items. 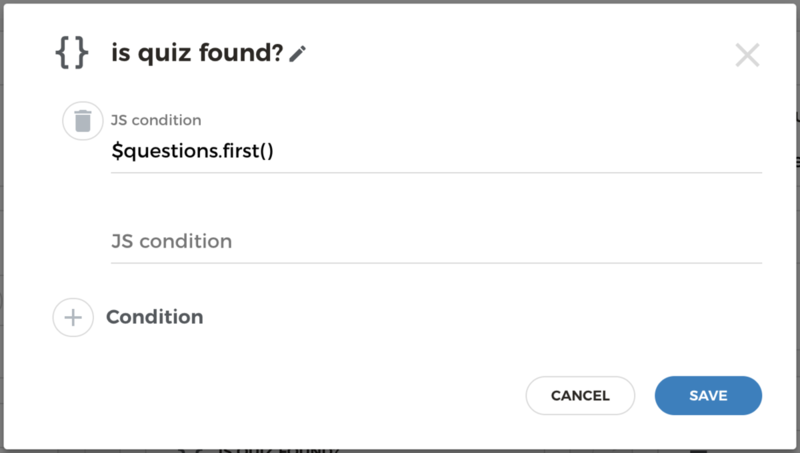 Use first() function to fetch a very first item from a list of quiz questions. And click Save. Here you can see that the bot outputs some text for the user and generates some speech. This speech contains a short audio track before the current question text. User can answer with Yes or No on every question of our quizzes. Then the bot should check if it&apos;s a right answer, generate an appropriate response and step forward to the next question in the questions array. Add Intents block to the screen and create two intents - yes and no. Save the block and click on the yes intent. A new screen appears. Add here a Conditions block to check if the answer on the current question is yes. Make the same for the no intent and create a Conditions block that compares the answer of the current question with "no". Once the bot has informed the user about the right answer, it should go to the next question if there are some remaining items in the questions array. If there are no more items - it should say goodbye and end the quiz. Add Transition block to each screen with right and wrong informer text and connect them with a new screen where the Condition block checks if there are some remaining items in questions variable. A special function next() will return a next item from an array. If the condition is met - then the bot can say the user some speech like "Going to the next question!" and transit to the screen with yes and no intents where it reads a current question of a quiz. 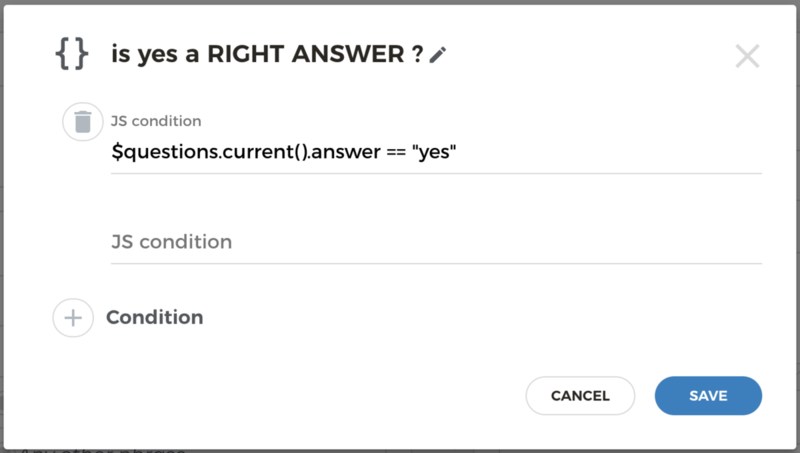 If there are no more questions in a quiz, an else branch of the Conditions block is firing and bot jumps to the screen with "Bye-bye" text. Add End of Scenario block to this screen to allow Alexa and Google Assistant to exit from your voice skill. Okay, we&apos;ve created a first version of our quiz game! Not it&apos;s a time to test it. Click on the Test button on the top of scenario and try to go through a one of quizzes. Let&apos;s try to connect your bot to the Amazon Alexa. Click on Channels menu item and then click on Alexa. Keep all settings as is and click on Connect button. Grant Aimylogic to manage your skills and go back to Aimylogic. 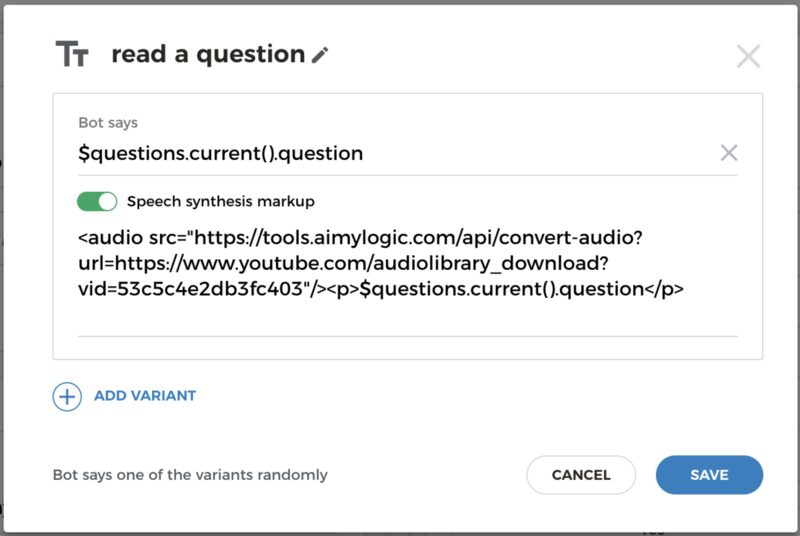 Wait for a couple of minutes while Amazon builds your skill and then go to the Amazon Alexa test console or grab your Echo device. Invoke Alexa and say "Play Kids Quiz" to start your skill. Now we are going to connect the same scenario to Google Assistant. Click on Google Assistant button in Channels section of Aimylogic. Keep everything as is and click on Connect. Click on Download action.json to download your action package. Then go through the steps described in Google Assistant article to connect your bot to the assistant. Once you&apos;ve done you can use any device with enabled Google Assistant to test your scenario. In this tutorial we learned how to create a single scenario for both Amazon Alexa and Google Assistant, how to use Google Sheets to separate content of scenario from the logic of scenario, how to use custom entities, branch the logic according the user&apos;s replies and insert audio tracks in the bot&apos;s responses.